If you’d told me a year ago that I’d be looking forward to mundane things like morning commutes and chopping onions, solely because that meant I could binge on an audiobook… well, I wouldn’t have told you you were crazy, but I’d probably have nodded and smiled and filed you away in the weird person trying too hard to sell me something category. I’d have maybe agreed to give the whole “listening to a book” thing a try, but it would have been grudgingly and with scepticism. In fact, I’d say I had a definite prejudice against audiobooks, even though I’d never listened to one. Why? As an aspiring author, I’d started going to readings. As much as I love meeting and supporting authors and going to writerly events and getting excited about books… I don’t love readings. I want to love readings, I try to love readings… after all, what better way for an author to publicly showcase their work than doing a reading of it? Yet no matter how great the writing, once the author gets a few lines in, my attention starts wandering. I find it hard to follow the story, and I suddenly become greatly fascinated by the floral pattern on the blouse of the woman sitting in front of me. I have to actively force myself to pay attention during those 5 or 10 minutes, and it’s hard work. All of this is to say, the prospect of an audiobook frightened me. If it was that hard paying attention for a 5 minute sprint, how could I keep focussed during a 10-20 hour long marathon? Of course, now I realise comparing public readings to audiobooks is like comparing the complimentary breadsticks to the main course. At the time, though, they seemed like one in the same thing. So what got me to finally take the plunge? Well, maybe just a touch of desperation. I’d set myself the goal of reading 50 books by the end of 2013. The trouble was, with my day job, and the time I was spending writing, and the fact that a lot of the books I chose to read were giant fantasy tomes… well, let’s just say my Goodreads Reading Challenge widget was regularly offering heartening reminders that I was behind schedule. I wanted to read more books, but I couldn’t quit my job, or invent more time in my day. So I got practical, and I thought: my commute. That’s about 2 hours of walking and sitting in the bus each day. If I could convert that to audiobook listening time, I could fit in more books. Yes, I told myself, it’ll be hard work listening to them, boring even, but my commute is pretty darn boring already so things can only improve, right? I signed up to try out a subscription service, downloaded an audiobook to my phone, and started listening. Fortunately, for my first foray into audiobook land, I chose a book I thought was likely to be entertaining. I figured if I was going to attempt this whole listening to a book thing, I’d give it the best chance of success. Then, if it sucked, I could give it up feeling I’d at least tried. So I chose Ender’s Game. Soon I found myself looking forward to going to work, because that meant more Ender’s Game. I found myself sad when I got to work, because that meant switching off Ender’s Game (though I waited till I was through the door of the office before grudgingly removing the earbuds). I found myself putting Ender’s Game on loudspeaker so I could listen to it while showering. I found myself sitting on a crowded bus with my jaw dropping open because Ender’s Game had just reached it’s shocking, fascinating conclusion. And eventually, tragically, Ender’s Game was finished. But it had proved something to me. If it’s an amazing book, and it’s being read to you by a talented narrator? Chances are it’s going to be awesome. So I went online and bought another audiobook. 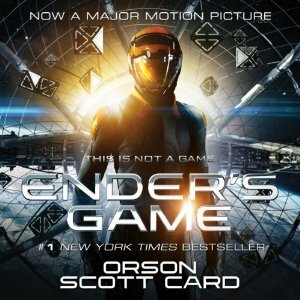 After Ender’s Game, I realised exactly why I’d been so wrong to compare the public reading experience with the audiobook experience. Readings require you to sit in a distracting environment with other people and focus both your auditory and visual senses on someone who is in all likelihood not a performance artist, while they read a snippet from their book that is too short to get you hooked into the story (If a book takes 10-20 pages to draw you in, a 5-minute reading – 1-2 pages – is generally not going to do the trick). Add to this that the passage you’re being read may be out of context, read badly, or just not very interesting to you… well, suffice to say, if your mind wanders it’s no surprise. Audiobooks can be listened to in your own time while doing other mundane activities that don’t require too much focus, and are usually performed by expert voice actors. They don’t require you to sit still and watch someone speaking, and once you get a ways into them, if the story’s good, you’re hooked. I admit, not all audiobooks are awesome. If the book isn’t great, well, having someone read it aloud probably isn’t going to make it any better. The quality of the performance plays a big role too. There are some audiobooks I haven’t touched because I listened to the sample, and decided I couldn’t bear listening to that voice for 15 hours. There are others where a mildly interesting story has been performed in a way just irritating enough to make me decide the story is not so interesting anymore… or even where a mediocre story has been made more bearable by a great performance. I’d hesitate to proclaim listening to an audiobook is better than reading the book, because I haven’t actually tried reading and listening to the same book. Perhaps it depends on the quality of the performance. But I’d definitely say I enjoy listening to books as much as I enjoy reading them. The best part is, audiobooks have allowed me to enjoy more books each month, while also giving my eyes a break from staring at computer-screens and tablet devices and pages. They’ve made my commute something to look forward to, and shown me how powerful a well-written story can be when read aloud. A year after getting that first taste, I’ve listened to 13 books, ranging from 7 to 37 hours long. I enjoyed pretty much all of them, and there are a few I’d highly recommend, because both the books and the performances were stellar: The Lies of Locke Lamora, The Scorpio Races, Ender’s Game (Actor Michael Page won an AudioFile Earphones Award for The Lies of Locke Lamora, and you can see why. It’s a brilliant performance). I still read hard copy books and ebooks, but audiobooks now form a key part of my monthly book-devouring experience. So if you haven’t ever tried audiobooks, it’s worth giving them a go. And if you have… well, what do you think of them? Are there any that blew you away? Any you loathed? As you point out, it would be a nice way to spend a commute. But I think if the book was too good, I’d be a bit worried about missing my train stop!! Great, I hope you like them! And samples are invaluable… I always listen to them before buying because a few do sound awful. Hopefully you don’t miss too many train stops 🙂 I must say I did miss the bus once because I got too absorbed in my audiobook and didn’t see it coming! I listen to audiobooks all of the time – while driving, cooking, cleaning, etc. I love them! You should check if your library is part of the Overdrive system. I download almost all of my books for free from Overdrive, and I also sometimes check out books on CD from the library and then upload them into iTunes. Even if you’ve already read Ready Player One, you should really listen to it as well – Wil Wheaton does the narration and is brilliant. I’ve never read Ready Player One, but I just checked it out on Goodreads and it looks like something I’d love. I think that’s one I’ll definitely be listening to, since you say the narration is great too! I haven’t ever tried Overdrive (I have an Audible subscription so I use that), but I’ve heard of it. I’m sure one of my local libraries would have it though so I might try it out.